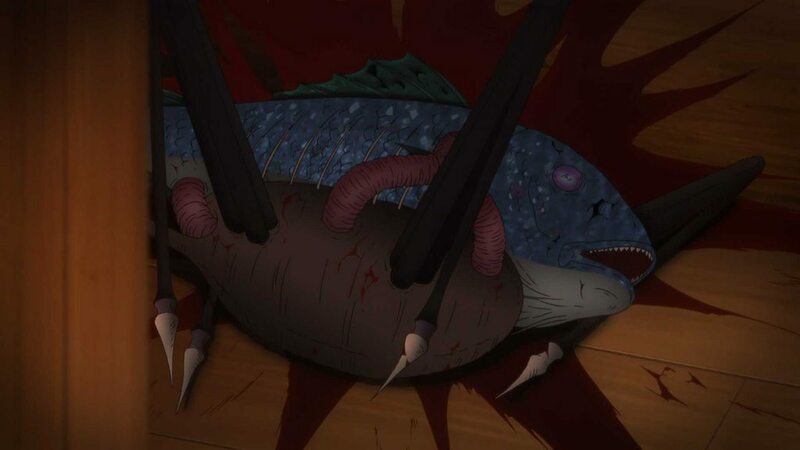 Based on the manga of the same name by Junji Ito, this surreal apocalyptic horror is brought to the screen by Takayuki Hirao and is a fantastic, bizarre, grotesque anime about mutated fish that arrive on land complete with metallic pincer like legs and a deadly disease. Kaori on holiday with two friends in Okinawa encounters the fish and a shark in the summer house they are staying in. After losing touch with her boyfriend, heads back to Tokyo to find him. Things are much worse in Tokyo though, the death stench and bacteria in the air ever increasing and the nightmare creatures evolving into far worse. I hadn’t really known what to expect from a horror anime, and I wasn’t familiar with either the director or the original writer’s work before, but really made an impression and lingered long after the credits have rolled. Definitely not for children to view, it has hints of the idea of tentacle erotica (something that pre-dates modern Manga) and yet still maintains a strong Eco message about how we reap our own destiny. The characters were simply portrayed, likeable Kaori, sexually active Erika and the average Aki, all of whose dynamic as friends changes and fractures as the crisis deepens. This is something that is also part of the horror in my opinion, that friendship might not last a crisis and how easily positions can juxtapose and change. If you want to see something a bit different I really do recommend this film. I would certainly be keen to see more of Junji Ito’s work on the big screen in future.